Product #46123 | SKU LEOGREY | 0.0 (no ratings yet) Thanks for your rating! 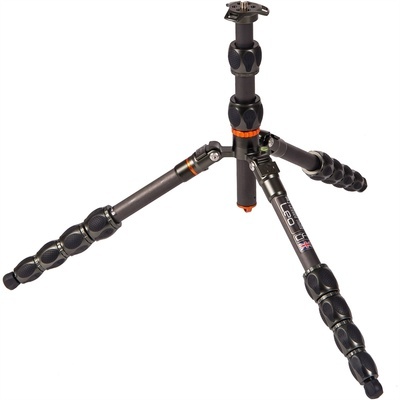 The Eclipse Leo Carbon Fibre Travel Tripod from 3 Legged Thing is an updated variant of the original Leo tripod. Identical in nearly every way, the Eclipse series only differs from the Equinox through the use of Gunmetal Gray coloured fittings instead of the classic blue and bronze. The Eclipse Leo features five leg sections that can extend to a maximum height of 131 cm and also go as low as 12 cm. At the 23° angle leg spread, which is considered a normal stance, the tripod can support a maximum of 30 kg. (The legs have two additional wider stances, and these will support less weight.) The twist locks' Para-lock feature works by restricting the opening movement of the friction lock, preventing you from accidentally unscrewing the lock until the leg section detaches. The two-section centre column can be inverted, enabling the user to raise the height of the tripod, while physically lowering the camera to the desired height. This is a helpful feature for doing macro photography. Fold the legs 180° in reverse to make the tripod more compact for travel and storage. All 3 Legged Thing tripods have a detachable leg with standard 3/8"-16 threads at both ends. The Tri-mount plate and threaded bolt can be unscrewed and removed from the top of the centre column, then screwed directly onto the leg. The detachable leg can be used as a monopod, microphone boom, or selfie stick. The legs spread to three angles of 23°, 55°, and 80°. Centre column can be inverted, enabling the user to raise the height of the tripod, while physically lowering the camera to the desired height. All 3 Legged Thing tripods have a detachable leg with standard 3/8"-16 female threads, which can be used as a monopod, microphone boom, and selfie stick.